A DAM effective way to share creative work and assets with your clients. 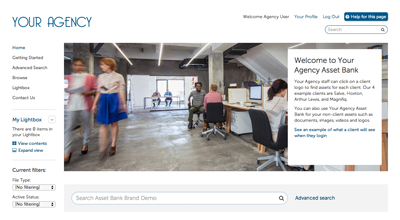 Asset Bank is a leading Digital Asset Management (DAM) system used by over 500 organisations worldwide including 19 UK FTSE 100 companies. Many of our clients are agencies, like you, who use their Asset Bank to securely and easily share assets with clients. We can also help you provide consultancy services to your clients who want their own system. Asset Bank is easily configurable for agencies. You can create branded hubs for each of your clients complete with their own look and feel. Your clients can then easily help themselves to their assets you have created at any time without having to bother you. They can reformat or resize assets prior to download and you can create preset sizes for web, print or social media. Asset Bank also comes with a number of advanced workflows to help you more easily collate feedback and approval when developing assets. We are used to working with agencies who have been asked by their clients to find a suitable DAM system for their needs. We can also help you set this up as a new revenue stream for your business.